GokaiRed: hm! lets make this a showy rampage! Momoninger: oh no, marvelous san's caught taka niichan's idiocy! Gokaiyellow: no, he's just playing around as always! Gokaipink: oh my, ninja san would you like me to put you out? Aoninger: please if you can make it stop. Shironinger: nagi let me borrow you gamagun, and you can use my sword! well be pirate ninjas! Gokaisilver: ah not just anyone can be a pirate! i had to earn the right! you can be apprentices! Gokaired: ninja/pirates. hm i like it. you ninja can be honorary ninja pirates. 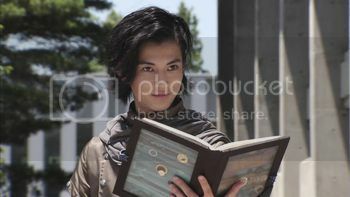 Starninger: im only a pupil ninja, so you and i have much work to do! (nods his head) now lets have a party night! gokaisilver! oh-oh-oh!!!! you just gave me an idea starsan! GOKAISILVER ..... GOLDDU MODE! akaninger: OH THATS HOT! GOLD MODE!? BUT WE CAN TOP THAT RIGHT LION-SAN? Akaninger: NOW IM REALLY FIRED UP! Gokaired: let's make this extremely showy then! gokaichange! They already have the Gobusters grand power. did not know that. im guess in the vs movie? 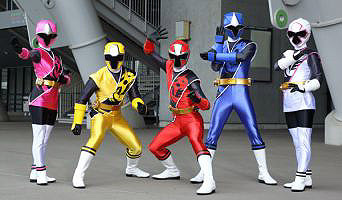 gobusters is on my next to watch list.